Breakfast Trifecta — Ginger writes. Most days, right after lunch, I make a breakfast item that is on rotation at our house. There is not an exact sequencing to it, only that I know in a mere 18 hours, I will have people hungry before school and something must be done. When the breakfast hour comes, I really only want to focus on making coffee and eggs for me and TJ, which means I want food to be in the fridge that my kids can help themselves to. 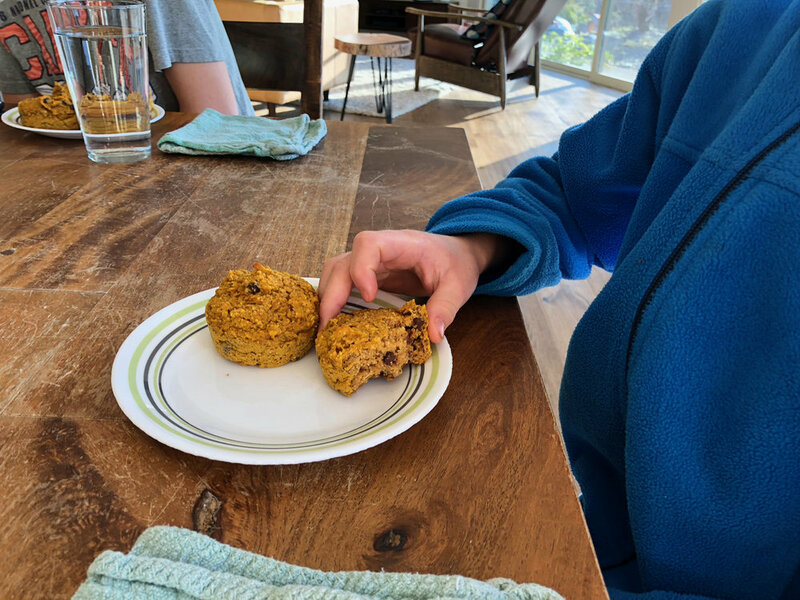 I have already noted in past blog posts a few breakfast items in rotation at our house: Chocolate Chip Oatmeal Loaf, Breakfast Cookies, Banana-Oatmeal Bars, and Mocha Glo Bars. But this season, for whatever reason, has me making muffins. Below I will share a little about each recipe and then attach PDFs at the end for all three. The first recipe is one we simply call "Muffin Tops." This is a recipe from the only Angela Liddon cookbook I own, and it's a good one. 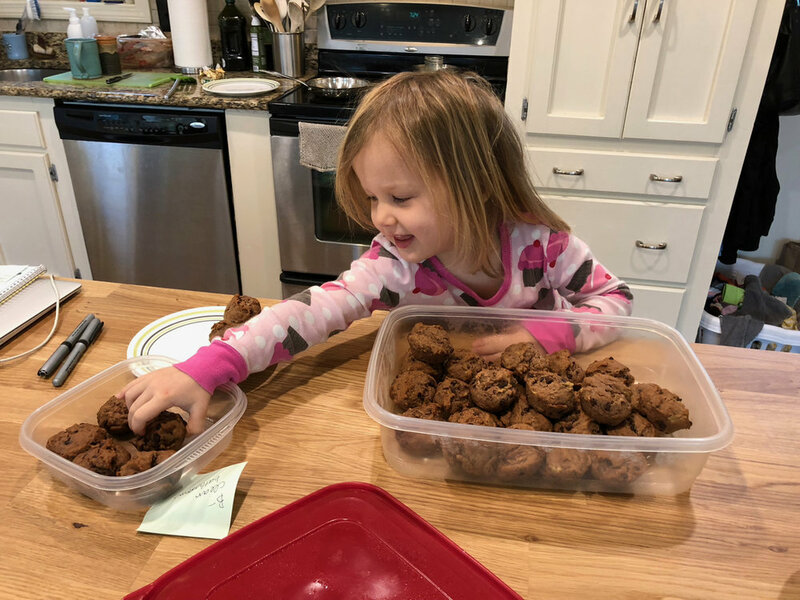 She calls them "Banana Bread Muffin Tops," but we think the texture is more like a big breakfast cookie than like a muffin. Bauer takes one of these in his lunch every school day, so they make great snacks as well. You only get 9 or 10 per recipe but they are big and filling. We keep them in the fridge, and as soon as the container has only one lone muffin top left, I always make more. (Tip: This means that even if no one in your house eats bananas, which is pretty much the case for us, you buy bananas every time you go to the store so you will have ripe bananas when you need them). Okay, on to the second recipe: Double Chocolate Banana Muffins. My friend Michelle introduced us to these a while back, and when I first made the muffins a few times back then, Sailor particularly loved them. But then I forgot about the recipe for half a year at least, until recently when Sailor started asking about the "brown muffins." I knew right away that she was remembering the chocolate. I have to tweak the original recipe a bit due to Bauer's egg allergy and Sailor's sensitivity to cow's milk. We have found that using goat milk yogurt doesn't bother Sailor at all, and we were already using the Enjoy Life vegan chocolate chips, which are dairy-free, in other recipes. For the egg replacement, I use "flax eggs," which are explained in detail on the recipe PDF below. I also use a gluten-free flour blend that I make and keep on hand, but you could easily use regular flour too. I've recently started making these muffins in a Silpat tartlet tray because I don't own their mini muffin pan (yet), but it works just as well I think. The kids are attracted to cute little things, and it feels like the muffins last longer when they are little. Bauer reads the newspaper at breakfast, always, and Story wears her Christmas jammies all year round. 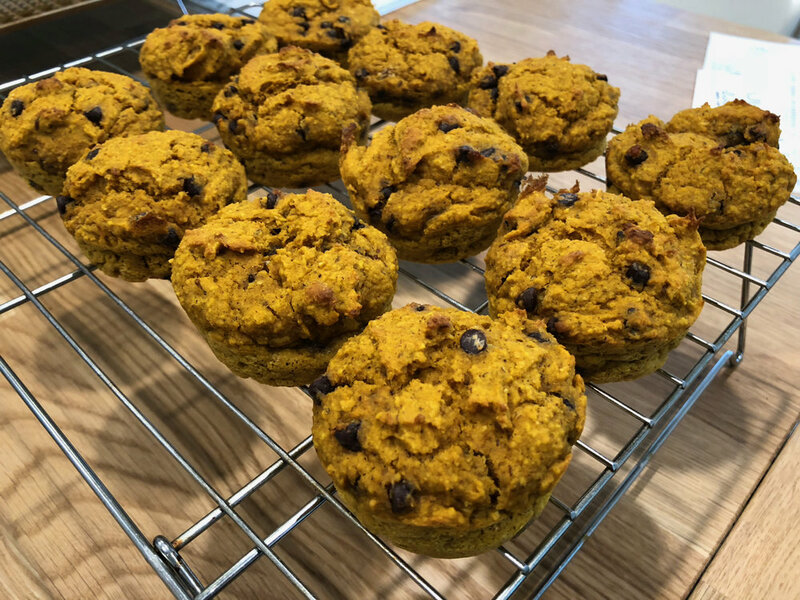 And as soon as those muffins run out, it's on to Recipe #3: Pumpkin Oat Yogurt Muffins. This might sound a little (or a lot) like a repeat in that Michelle shared this recipe with me too, and I use goat milk yogurt and flax eggs to replace the Greek yogurt and eggs, and I use my Silpat muffin pans. I sold my two Pampered Chef stoneware muffins pans on eBay last year to buy these, and without a doubt, they are the favorite kitchen item I own besides my Vitamix. To make the muffins a little less "treaty," I reduced the sugar and the chocolate chips from what the original recipe called for. No one seems to think they aren't sweet enough, and no one says they are tired of them yet. I personally don't like the texture of the muffins, which is kind of chewy, but the kids love them, and Bauer especially. He eats five for breakfast two days in a row on the days we have a double recipe of the muffins in the fridge. Sometimes there are even a couple left for him to have with cereal on the third day. Older PostWhat Shall We Wear?